1. Subscribe to my blog (Salt+Light) by entering your email on top right side of my blog. 2. Share this blog post on your Facebook, Twitter, or LinkedIn account. I will randomly announce two winners by Friday, March 29 and contact them individually. Enjoy the read! My wife and I self-published our first two books this past year. The first book has been downloaded by over 4000 people in 4 months, and has made it to Amazon’s bestseller list in its category. The second book was just released this week (and you can win a free copy). There are many people in the world that need to hear your voice and your story. Your experiences as a leader are unique, and there are others that learn much from hearing what you have to say. The problem is that many of those people will never meet you face to face. Writing a book allows people from all around the world to benefit from your experience and expertise. John Maxwell is famous for saying, “Leadership is influence.” As a leader, you influence the people you interact with on a daily basis, whether it is people that you work with, your friends, your family, or even acquaintances you interact with occasionally. Writing a book increases your influence, and allows you to broaden your reach. You have only so much time that you can spend with people. By writing a book, your influence is multiplied, as it is not limited by the amount of available time you have. When you have to write a book, you are forced to think deeply about your experiences and articulate it in a simple and understandable way. This will sharpen your thinking and deepen your expertise. According to Seed Magazine, only 0.1% of the world’s population has written a book (based on the year 2009). By becoming an author, you join a small minority of people in the world. Also, the world perceives authors as more credible and more of an expert. Having the distinction of being an author adds more clout to your resume. 26 of the Top 100 books on Amazon are self-published. Self-publishing is becoming more common and more acceptable. Gone are the days where you need to jump through hoops of having a traditional publisher accept and print your book. The cost and time to publish your eBook are minimal, which allows more people to write more books that help more people. According to the New York Times, 81% of Americans believe they have a book in them. Yet so few actually write that book. If you’re a leader, I urge you to seriously consider writing and publishing a book. Don’t wait for a publisher to choose you, self-publish and let the world hear your voice. Tim is a cheerful pessimist and always thinking. He proposed to his wife Olive with a goat (and no diamond ring). He and his wife’s first book, Fight With Me: How We Learned to be Married, has been an Amazon Best Seller in its category. 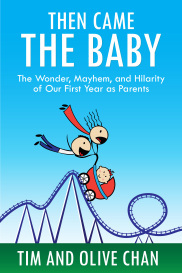 They recently released their second book, Then Came the Baby: The Wonder, Mayhem, and Hilarity of Our First Year as Parents. Tim and Olive blog together at www.timandolive.com and live with their daughter near Vancouver, BC.